Less than a year ago, I examined 19 reader complaint letters sent to The New York Times regarding errors in the article “As Wild Horses Overrun The West, Ranchers Fear The Land Will Be Gobbled Up” (Sept. 30, 2014). I also collected the editors’ corresponding responses. No corrections were made. What I learned from this exercise is that your statement that “Times leaders are listening to their readers” (from your October 7, 2015 article, “Readers Will Rule, Says The Times, So Don’t Be Shy“), doesn’t extend to readers who happen to be wild horse advocates, wild horse groups and anyone critical of The Times’ wild horse coverage (including, in this case, three PhD’s and two academics, one of whom published two New York Times op-ed pieces, five books and is a columnist on food and agriculture for Pacific Standard). The Times writer (David Philipps) cited rising wild horse population estimates from the Bureau of Land Management (BLM) website; but he did not provide any corresponding livestock population stats. (The BLM doesn’t share these, even when asked; but they can be calculated from grazing receipts and AUMs listed in the BLM’s online section on “livestock grazing”, as well as through the agency’s rangeland administration database). Phillips instead took the ranchers’ word that land was being “gobbled up” by wild horses. One might ask how a reporter can determine that wild horses are overrunning and out eating cattle without knowing how many of each and, at the very least, providing photographic proof. Phillips’ article offered neither. The complaining letter writers rightly pointed out that cattle do in fact outnumber wild horses by a significant margin, not just in protected wild horse habitat, but on millions of acres of public rangelands that are leased to private livestock producers and sought by energy and mining companies (but which have zero wild horses on them). The problem arose, though, when they couldn’t cite sourced figures to back that up. Had they done this, The Times would have been hard pressed to stick with the story’s premise of “wild horse overpopulation” causing extensive rangeland damage. For the record, 2014 BLM grazing receipts put the ratio of cattle “livestock units” to wild horses out West at roughly 17:1 (this translates to a ratio double that number since a livestock unit, as defined by the BLM, consists of a cow and a calf). AUMs (a metric used by the BLM to indicate how much privately owned “livestock units” eat on public lands in a month’s time) can also be converted into a ratio of cattle/livestock units to horses. On land managed for grazing by the BLM and the US Forest Service, it’s 23:1 — again, a lowball figure given that a single animal unit = a cow and a calf (or five sheep). By siding with ranchers and ignoring the subject of livestock totals, The Times turned a deaf ear to evidence provided by readers that would have undermined the headline “wild horses overrunning the west”and the story that followed it. Advocates do the kind of research that reporters do not have time for. They read studies, go to BLM meetings, do FOIA requests, observe roundups, write letters and articles, start petitions, visit their elected representatives and follow new developments — day in and day out. But they are given short shrift in the media’s “he said/he said/he said/she said” telling of the wild horse story. Yes, they need to be cross-checked, as any source does — ranchers, included. The Times, for its part, heard from 19 different voices on the “she said” side, all pointing to a serious flaw in its wild horse reporting — and turned its back. 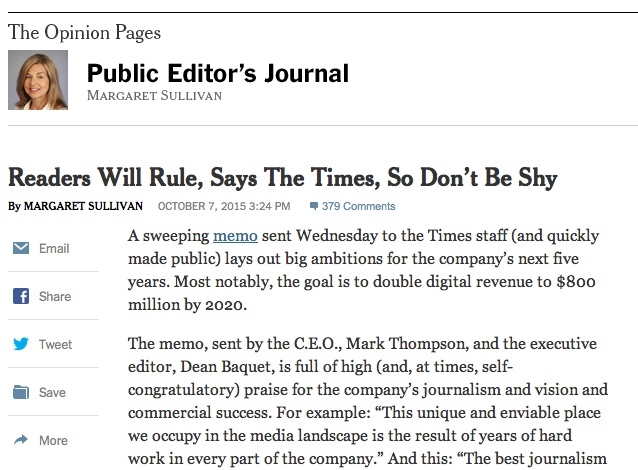 If The Times wants readers to “not be shy” about speaking up, heeding their expertise — and making necessary corrections — is a good place to start.